Here's a listing for a 1975 Marshall Super Lead 100 which, according to the seller, was formerly owned by Paul Gilbert (Item #: 320439314600). 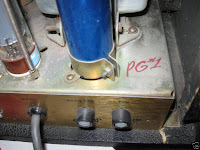 PG apparently used this amp on Racer X's Second Heat. Extensively modded by metal amp guru Lee Jackson, this amp apparently went through several modifications -- including some by Paul's dad -- before arriving at its present state. Jackson's final mod included the addition of cascading gain stages, a tube buffered effects loop and a power attenuator on the push/pull Master volume knob. 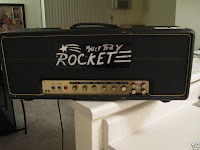 The front panel of the amp also features a custom plaque -- the famous 'Mel Bay Rocke t' logo -- installed by Paul's dad. Paul's first guitar teacher used the Mel Bay guitar method which bored the six-year old Paul to tears -- so much so that he stuck with his lessons for 'only' three years. Good luck holding a six-year old's attention for three months these days. There is no Certificate of Authenticity but the seller promises to provide the buyer with email correspondence from Paul as documentation. 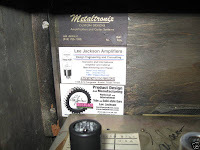 This seller also has another 50watt Marshall JMP purportedly owned by George Lynch and with a mod by Tim Caswell that was undone, returning the amp to stock. I never much cared for Lynch's tone, but you can check out the listing here. If you buy this amp and your tone starts to resemble a swarm of mosquitoes, don't say I didn't warn you. This seller seems to be a genuine collector but as always, caveat emptor, or as my buddy JP at Stratoblogster would say, "Due dilligence kids!" Buy Racer X CDs Here! I am the owner of this amp and I'm not sure what you meant by the "swarm of mosquitoes" remark but I asure you there is nothing thin sounding about this monster... maybe you're referring to Paul's licks being so fast they start to sound that way lol! I still have it and the Lynch amp which even though George said it was a Caswell and I openly expressed my doubts, I would say that it is not. But, its still a sweet head with ton's of history! ... or maybe you were talking about Lynch's tone? lol Either way, the Lynch amp has a beautiful full sounding clean tone, I like it better for that than I do the drive sound though its very sweet as well! I'm sure you have two very fine amps there. I was talking about Lynch's tone -- never been a fan of his sound. But maybe George just hears things a little differently, no? At his age I'm sure he hears alotta things differently lol! Cool site!